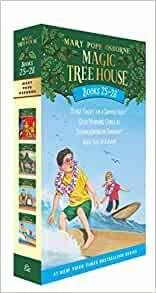 Travel all over the world and across time in the magic tree house! Jack and Annie are just regular kids, but Morgan le Fay, the magical librarian, thinks they’re ready to learn some magic. What kind of magic? Find out when Jack and Annie meet William Shakespeare, a group of gorillas, the Plymouth Pilgrims, and a couple of great surfers from Hawaii! Books in this set include Stage Fright on a Summer Night (#25), Good Morning, Gorillas (#26), Thanksgiving on Thursday (#27), and High Tide in Hawaii (#28). 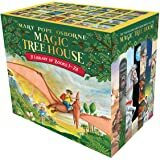 MARY POPE OSBORNE is the author of the New York Times number one bestselling Magic Tree House series, as well as co-author of the Magic Tree House Fact Tracker series with her husband, Will, and her sister, Natalie Pope Boyce. SAL MURDOCCA has illustrated over 200 children’s trade and textbooks. He teaches children’s illustration at Parsons School of Design in New York City. 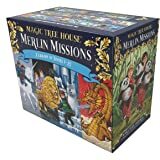 My 8 year old daughter has read all of the first set of the original Magic tree house and has now started on the second series. She loves the adventures they go on and the way they are actually educational. We can't keep them ordered fast enough! Our 5 year old son also enjoys listening to them so we are hopeful we can go through the set a second time when he learns to read. A great easy reader for my little guy, who is learning to read by himself. The language is fairly simple and he can ask me about the more difficult words. The plots are engaging and keeps him wanting to read to find out the ending. We love all the Magic Tree House volumes! 5つ星のうち5.0Loved by parents and their children! The Magic Treehouse Books are fantastic! My daughter and her 2nd grade classmates are really interested in them. They typically read an entire book within a day or two. By far the best aspect of these books is that they are educational! 5つ星のうち5.0Good chapter books for your kids! Our 5/6 years old had been loving these books,! Love the fact that Jack and Annie support each other while on their adventures! Love the fact that the stories also teach the reader/listener a little bit about history, all the while encouraging reading!